Alameda County is a heavily-populated jurisdiction on the east side of San Francisco Bay. Stretching from Berkeley to Fremont, its largest city is Oakland. Despite this urbanization, there are many birding spots along the shore of San Francisco Bay that have tidal mudflat or marsh. Several freshwater urban lake attract migrant ducks (including Lake Merritt in Oakland). Hills behind the cities have chaparral and mixed woodlands, and there is extensive grassland beyond Livermore in the southeastern corner. Mines Road starts in those grasslands and rises through a series of habitats as it ascends the Diablo Range. 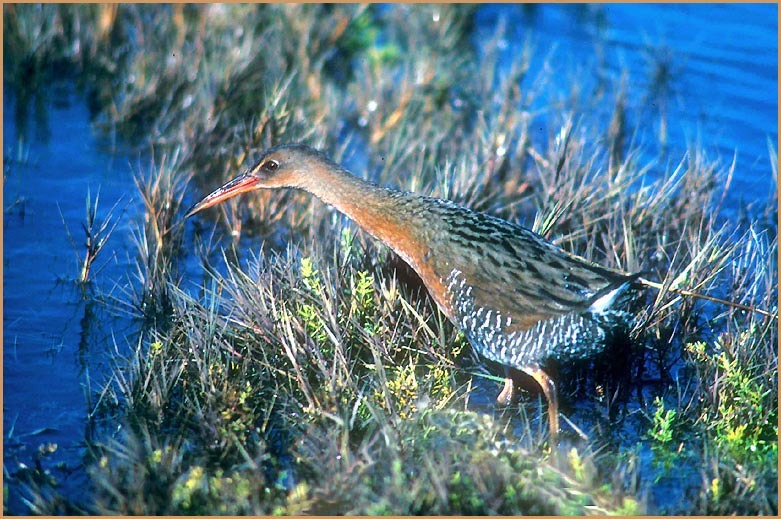 For Alameda County, I chose this Clapper Rail, taken during an exceptional high tide many years ago in the marshes at the east end of Dumbarton Bridge. The lighting was just perfect and the rail caught in mid-stride. I've taken many other shots of Clapper Rail at the Palo Alto Baylands on the other side of the Bay, but none seem so nicely positioned as this. I lived in Alameda County during the years I attended college and law school (1973-1979), and I chased numerous vagrants back then and, occasionally, more recently. 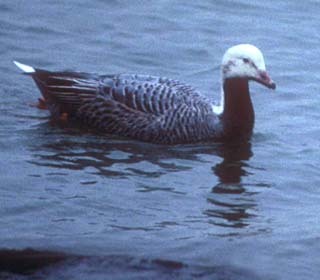 One fine one was a young Emperor Goose on Bay Farm Island (27 Dec 1987; below left). Another was a Black Skimmer near Alvarado on 20 July 1978 (below right); at the time it was a first Alameda County record and only the 4th for northern California. There is now a nesting colony of skimmers in south San Francisco Bay. Here's a couple of views of Alameda County habitats, taken many years ago (Jan 1976): Lake Merritt in downtown Oakland (great for diving ducks), and the Alameda shore shore (a fine shorebirding spot).